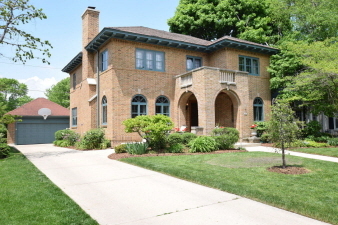 This stately four bedroom home in highly desirable Shorewood neighborhood has just become available. The main floor has a spacious living room with natural fireplace and hardwood floors, and a formal dining room with coved ceiling. A new, large eat-in kitchen is bright and features stainless steel appliances and soft close drawers and cabinets. Upstairs find three bedrooms and a full bath, plus the large master suite with walk-in closet and bathroom with tub and separate shower stall. The beautiful fenced in yard w/ huge deck is perfect for summer entertaining. Schedule your appointment today!